As much as I would love to travel the world forever, I would probably lose interest in it at some point. I like being able to dip in and out of airport as I please (or as my annual leave allows).My life is here in London… for now. 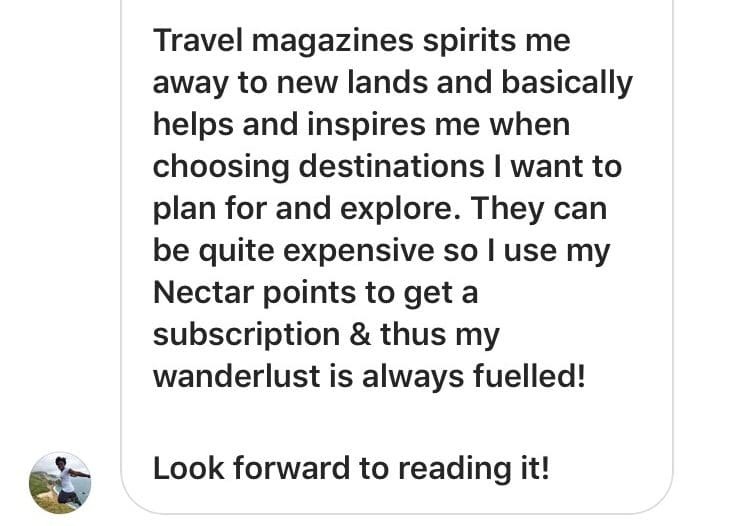 I threw this question out there to the Twitterverse (and Instagram) as I was intrigued to find out how my fellow travellers keep their wanderlust spirit alive when they’re back home. Aside from vlogs, travel documentaries are a great way to educate yourself about the world around you. The Globe Trotter (Deeptha) from the aptly named Globe Trotter blog loves watching a series that strongly focuses on ecosystems. The world as we know it is disappearing, so it is important to keep these stories alive and show everyone that we must save what we have left. 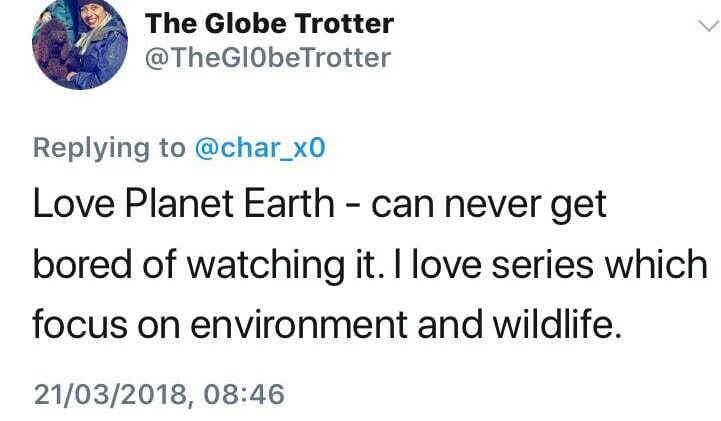 Planet Earth is a guilty pleasure of mine too. Its insane just how much work goes into creating one episode. Tayo from the 5 to 9 Traveller is another traveller who travels using her annual leave (hence the name!) and she also enjoys having something tangible to read. 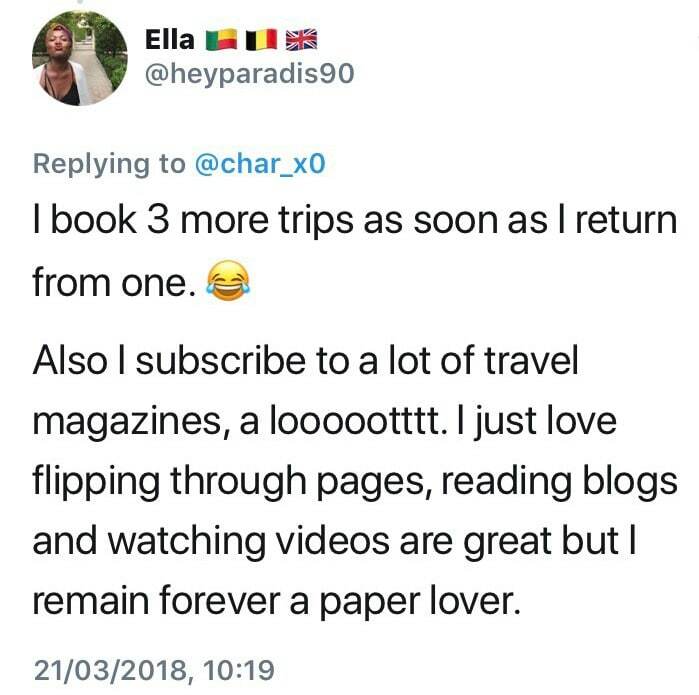 Having a subscription keeps the travel spirit alive month by month and its a great way to discover new destinations, new ways to travel and new activities to do. Just looking through your camera roll whilst you’re on your daily commute, lunch break or just lying in bed is another way to keep the travel spirit alive. If anything its mental scrapbooking as a photo has a thousand meanings, or so they say. 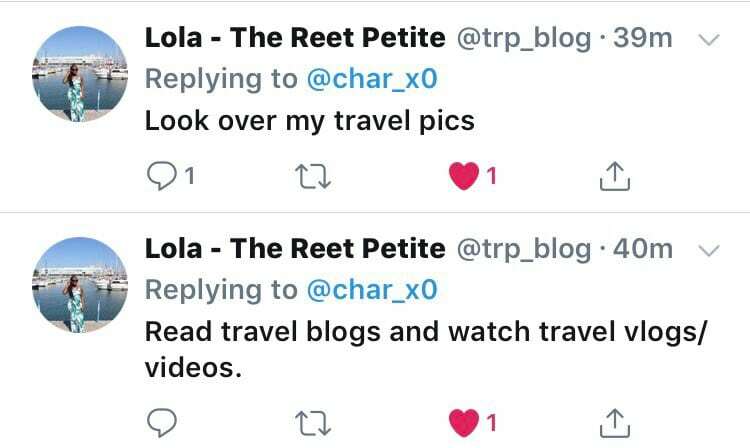 This is Lola from The Reet Petite blog’s favourite way to keep her travel bug alive, and did I mention she also runs her own brunch club? I wanted to get down to the next one but ironically I am away but you should head on down for brunch and good vibes. Get your tickets here. Perfect symmetry (and colour). Check out Lola’s IG here. 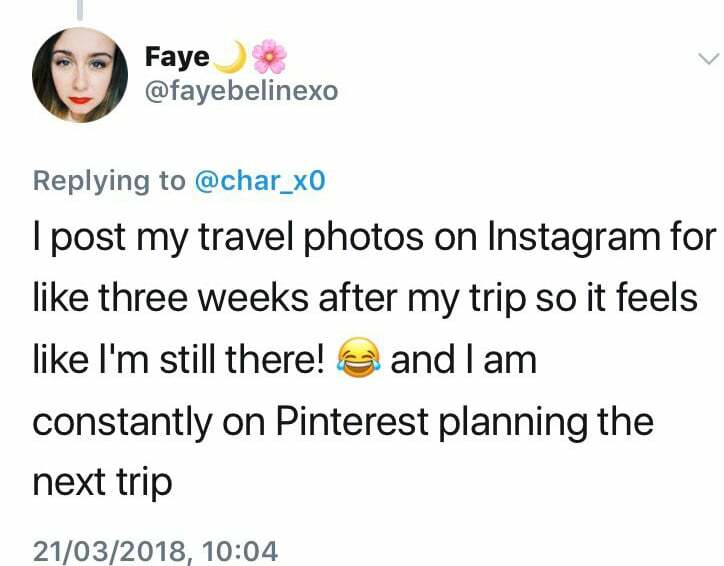 Faye keeps the spirit alive by not spamming her IG timeline with pics whilst she’s away. Instead she spreads the content out for a little while after her trip, thus giving the illusion she is always travelling. I concur Laura! 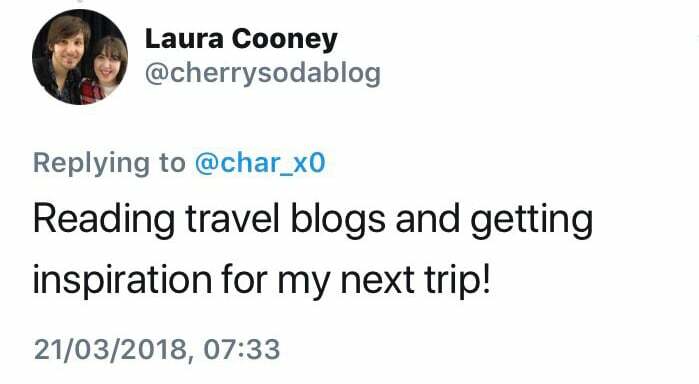 You can check out Laura’s blog here. You can never be TOO prepared. 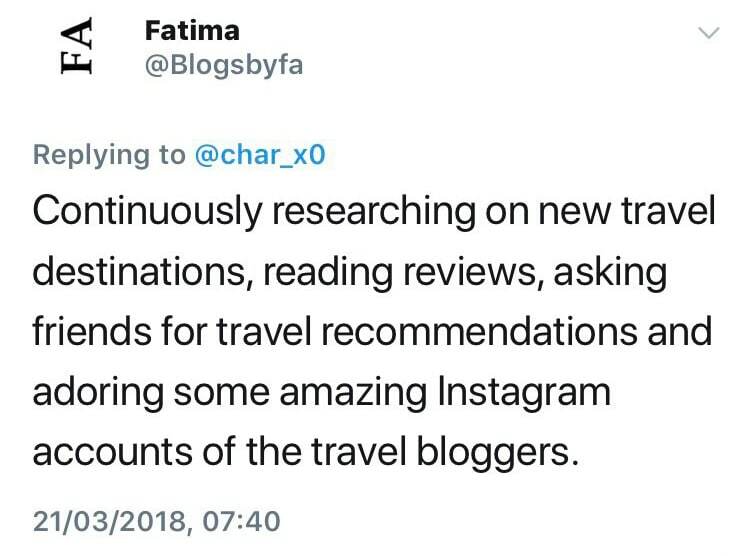 Fatima’s blog focuses on UK lifestyle, family travel and where to get the best Halal food. If I’m honest, I never really thought people would still have scrapbooks. I think I just assumed we’d all turned to Pinterest, but its great to hear this art is still alive. Keeping your plane ticket stubs, shells or any other momentos from your travels is a beautiful way to relive the memories other than pressing ‘repin’. 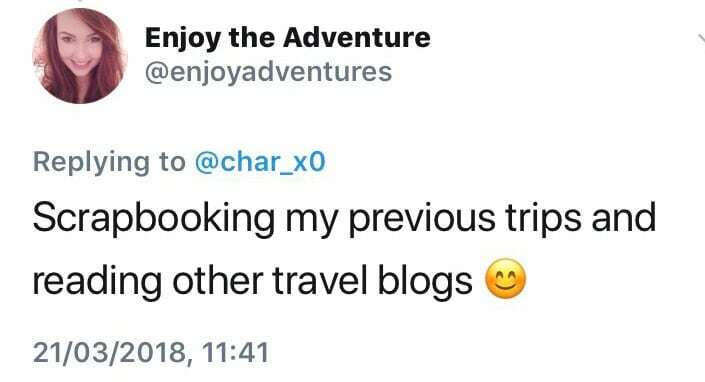 You can check out Jess from Enjoy the Adventure’s blog here. Scrapbooking is a great way to enjoy the adventure when it’s over right? Emma likes to keep her travel spirit alive through talking. The best way to share tips, tricks and of course your experiences. Diarising a few is a great way to have a moment every week to reflect on your travels and look forward to the next ones! 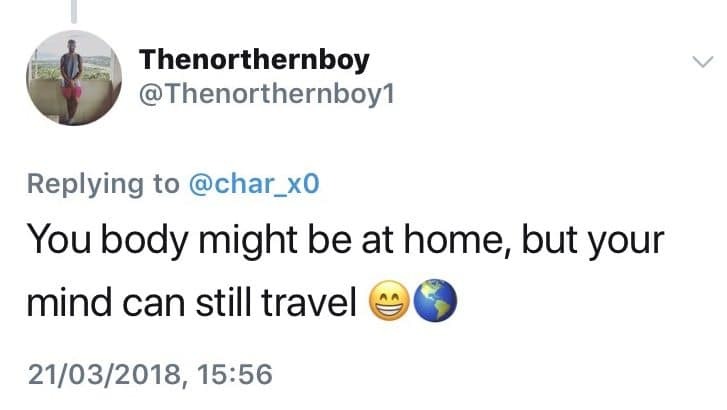 Beautifully put by The Northern Boy. Podcasts and books are a little forgotten in a visual world of Instagram, vlogs and blogs. 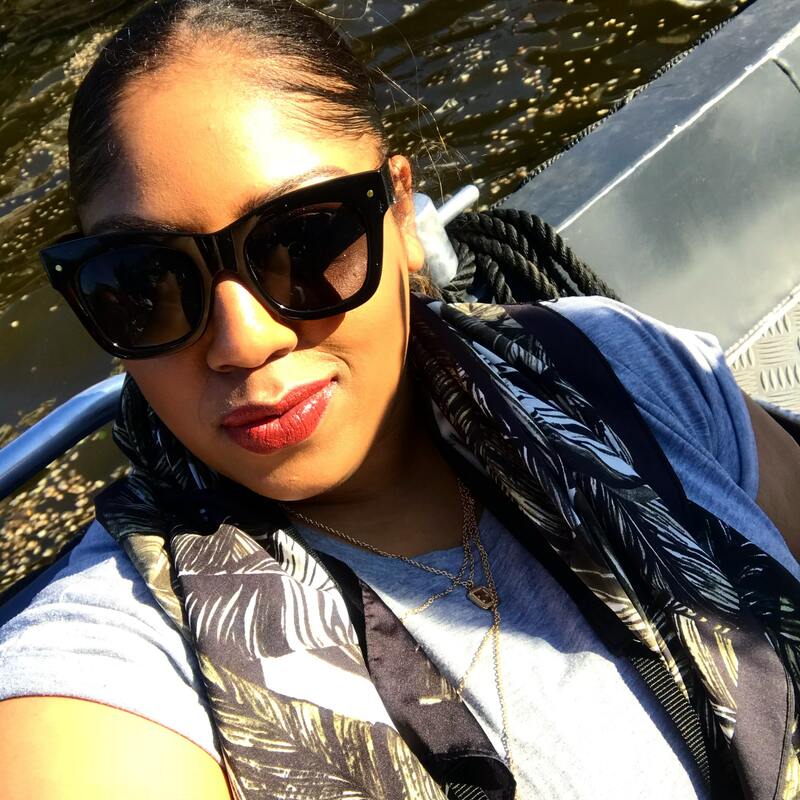 The beautiful Selina from Fashion and Beauty blog Selina Wears uses her ultimate destination as a way of keeping her travel spirit alive. Every trip until then is a stepping stone until the ‘big one’, wherever that may be. 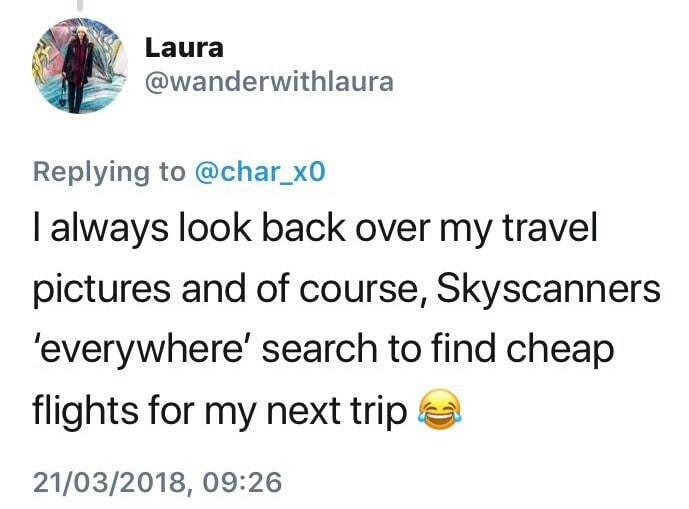 Although, if that dream destination is just a dream for now, try exploring the Skyscanner everywhere option like Laura from Wander With Laura does. 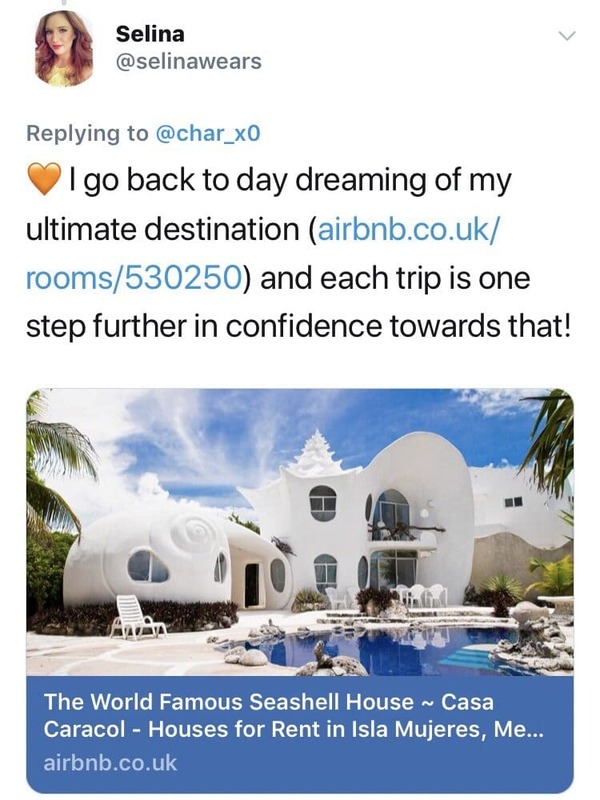 I’m so impressed with her Singapore on a budget post that I’m browsing flights right now (Sentosa Island looks out of this world). Browsing low to high is the key to a good life. A little extreme, but I have Wanderlust tattoo on my right shoulder and it reminds day after day that I’m not supposed to be in one place forever. That’s why I have feet right? I’m kinda shocked food wasn’t a popular answer? 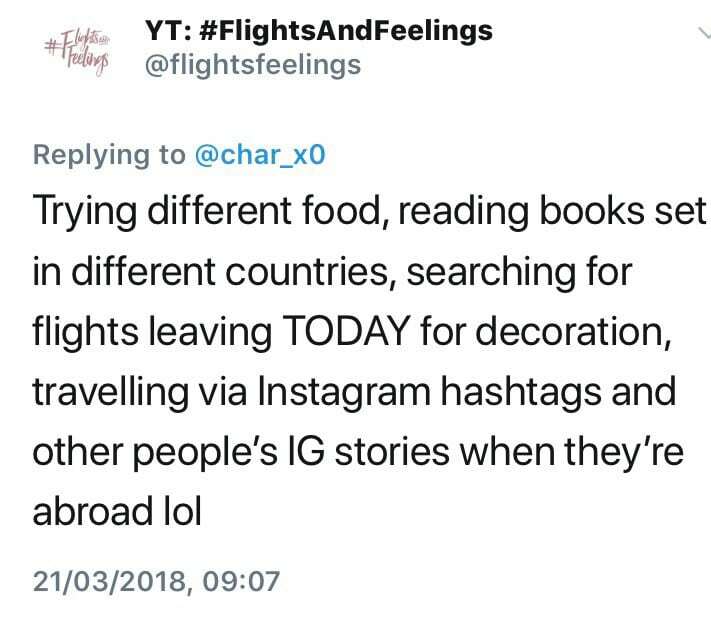 The ladies behind Flights and Feelings summed up exactly how I love to keep the spirit alive by eating. You can be in Greece one day and India the next from simply walking through your local food market… or using the Just Eat app. Whats funnier is them looking at flights leaving today to keep their bug alive… (IF ONLY). My favourite response. Food is life. Check out their YouTube channel here and our accidental collab post here. 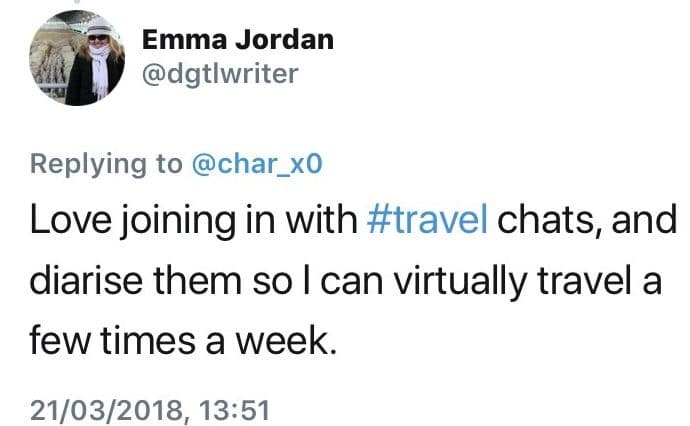 One of the main reasons we (I’m talking to the ones with commitments like work, families and bills) we can’t travel constantly is mainly due to funds, work and life taking over. Some of us are able to take work with us, become digital nomads and make it work. But there is no right way to travel. Not all of us want to combine our worlds. But travelling doesn’t just mean you have to get on a plane or train. Your hometown and current surroundings are waiting to be discovered, waiting to be explored and documented somehow. Everywhere has history, or some places are waiting for something to happen. 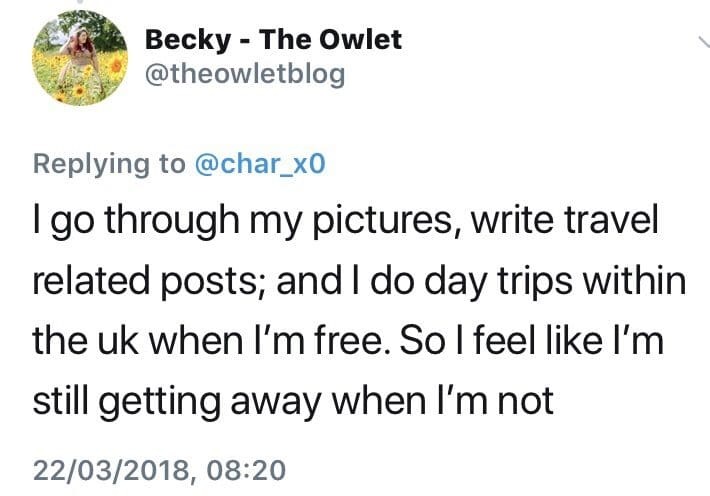 You can check out Becky’s travel content here for inspiration! What are ways you like to keep your travel spirit going when you’re not travelling? Thank you to all who took a minute out of their day to respond to my tweet/IG story. You guys are the greatest. "Memoirs: Working Out With Esquared"
"Memoirs: The Perfect Pizza at the Kings Arms in Hanwell"
I thought this was a great idea for a post. People become trapped in their own lifestyles. The thing is, we can travel without actually going anywhere (like Jay K, travelling without moving). It’s more about a mindset. Although granted it’s much easier to get into that mindset by actually travelling. Thanks so much for commenting Dan! You can definitely travel without moving and its a beautiful feeling when you realise you don’t need to book a ticket to travel! I cannot wait to go on holiday! I really appreciate this post! I’m not a full time traveler, and prefer to take shorter trips and have a place to come home to. But I get wanderlust if I haven’t traveled for a few months or so… there’s just so much world to see and after a while the routine of home can get boring. I think these suggestions are great, but I feel like a lot of them actually make me feel more nostalgic and envious than anything else though! I read travel blogs and then I’m like “can I just be there right now?” but alas… I think what helps me most in between trips is feeling like I’m “traveling” in my own city – getting out and meeting new people, trying new things, having the sorts of experiences that you might have while traveling – but from home. It helps me to be present but still unlock that risk-taking, open-to-anything side of me that comes out in full force while traveling. I am constantly looking into new places to go and scheduling the next one or I lose my mind! Such a cool post. I started blogging for several reasons, but find that is a great way to reflect on my travels and dream of the ones to come.